How do you make time to work on your business’ development? Probably the most common issue that small business owners and would be entrepreneurs raise with me is a lack of time. Too little time to develop new projects; too little time for administration; too little time for marketing. This is an excuse. A genuine excuse but an excuse none the less. I know that my clients work hard. I know they don’t waste time (often). I know that they are often overwhelmed by the sheer amount of work they have to do and that can lead to a type of paralysis. When we feel overwhelmed we tend to flit from job to job achieving little so the problem just gets worse. Well there are numerous books on time management out there and I’m not about to write another one but here’s a technique that I find really effective: the Power Hour. I was introduced to the concept by Carrie Wilkerson, AKA The Barefoot Executive. When you have finished your hour make a note of where you are up to or what you need to do next so that when you get another hour you don’t waste time working out what you have to do. If you are anything like me you’ll find that you don’t want to give up when your hour is up! Fine if there is nothing else pressing in your diary but all too often life gets in the way. This article is adapted from my 21 Day Make Money Challenge, where there are plenty more tips. We have new groups starting the challenge on October 21st and November 21st. Why not join us? 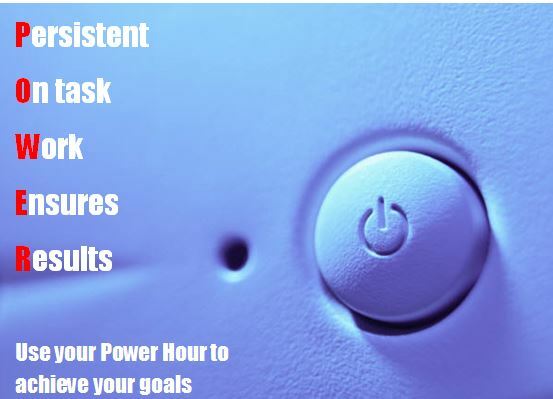 This entry was posted in Personal development, Time management and tagged Barefoot Executive, Business, Power hour, Time, Time management by glendashawley. Bookmark the permalink.